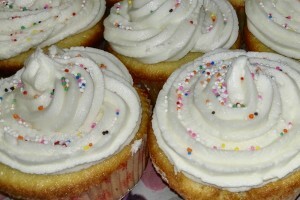 Vanilla cupcakes, it’s not chocolate cake but when you are in the mood for it, there is nothing better. I found this recipe online (I cannot remember where) quite a while ago and to me this is simply the best recipe. Both the vanilla icing and cake mixture are simply PERFECT. There is not a word more appropriate to describe this recipe. Both the cupcakes and frosting is super fluffy and light and the cupcakes are moist as well. To me there is nothing worse than a cake that is dry, which is typically what you get with a store bought cake therefore I prefer to home bake all cakes. An added advantage is that this is a one bowl cake and therefore your husband will have less dishes to wash and less to complain about – bargain! 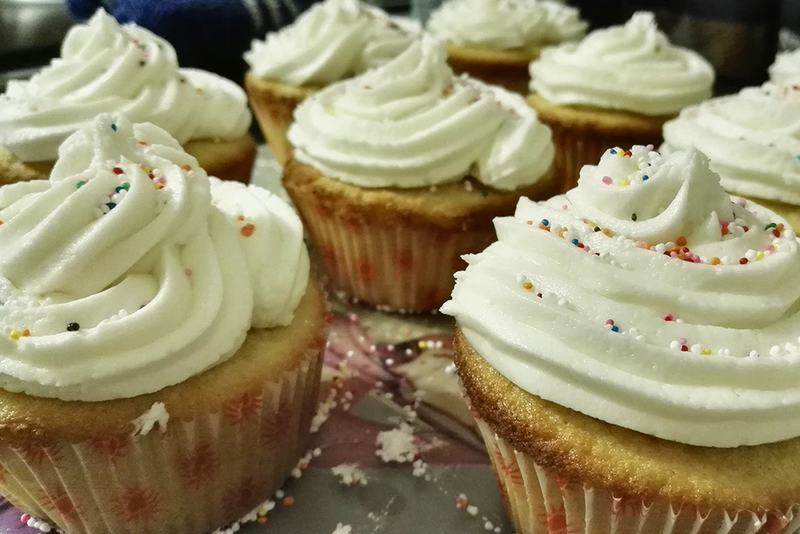 Moist and Fluffy one bowl Vanilla cupcakes. Simply PERFECT. Preheat the oven to 180 C. Line 24 cupcake pan cups with paper liners. In a big bowl sift flour, sugar, baking powder and salt together. Add butter, milk and vanilla essence. Beat on a medium speed for 3-4 minutes. Add eggs. Beat for another 3-4 minutes. Fill the prepared cupcake liners with batter 3/4 full, and bake in the preheated oven for 15-20 minutes or until a toothpick inserted in the center comes out clean. Beat butter on medium speed for approximately 3 minutes until creamy and pale. Add 1/2 cup of confectioners' sugar at a time and beat for 10 seconds on high speed before adding more confectioners' sugar. Add vanilla essence and a pinch of salt. Add milk spoon by spoon, beating for 10 second in between on high speed until desired thickness is reached. In my experience 3 tablespoons does the trick. Once the cupcakes have cooled down, pipe the icing onto the cupcakes using your favorite piping technique. To thicken icing, add confectioners' sugar, 1/4 cup at a time beating for 5 seconds in between on high speed if you added too much milk. If you wish to bake a cake instead of cupcakes, prepare two 20cm square pans and divide the cake mixture between the two pans. Bake for 30-35 minutes. For buttercream piping tips and techniques, watch this video by Cupcake Jemma. I would love to hear and see how your vanilla cupcakes came out, so let me know on Twitter and tag me on Instagram or Facebook when you give this a try. Like it? Loved it? Share it!